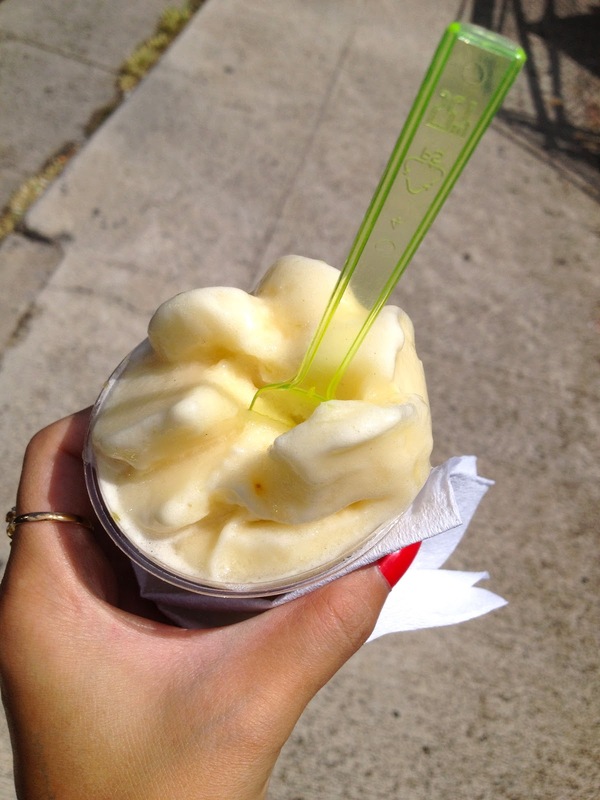 The Fashionably-Forward Foodie: Via Gelato UPDATED! I've fallen in love with this Gelato/Sorbetto truck! Today, I found Via Gelato parked in the Rainbow Drive-In lot with two brand new flavors- Chocolate Haupia Sorbetto and Pineapple-Ginger Sorbetto. Not a big fan of Chocolate, I asked for a scoop of her Pineapple-Ginger. IT WAS AMAZING. Especially on a hot sunny day when the heat is bouncing off the pavement. It was refreshing- the perfect balance of non-spicy ginger and pineapple. I was surprised how subtle it was- not overwhelming at all. A very light sorbet. DELICIOUS! I have to say I like it more than her Makaha Mango. This one's taken the top spot, Mel!! Catch her Tuesdays and Thursdays from 11am-3pm in the Rainbow Drive-In parking lot! I keep hearing about this gelato all over twitter and instagram. The haupia sounds so yummy, can't wait to try it on my next trip to Oahu. Btw, if you ever come to Maui, you'll love Ono Gelato in Kihei, Paia and Lahaina. Made with fresh ingredients, many local. Great pic, now I have gelato envy.